As promised I am back with the best menu ever for the next time you have guests over. This week you lucky gals are getting two recipes instead of just one I have my friend Melissa to thank for this delish Tuscan Chicken Cake Recipe. As soon as we made plans to have friends over I immediately texted her and told her to send me her favorite entertaining recipe. She is a great cook so I knew I would not be disappointed. These Chicken Cakes are very similar to Crab Cakes. I absolutely love the Mediterranean twist on them. Adding in a little pesto and roasted red peppers gave the cakes great flavor. The best part is that you can make them ahead. I made the cakes and both sauces the morning before our friends came over and just refrigerated them til I was ready to cook them that night. They also look pretty beautiful plated. You and your guests will love these tasty cakes. 1 Package mixed salad greens. In a large bowl, mix together chicken, ½ cup bread crumbs, mayo, egg, pesto, honey mustard, roasted red peppers and onion. Shape chicken mixture into 8 cakes. Lightly coat each with remaining ½ cup bread crumbs. In a large nonstick skillet, place oil over medium high heat. Cook chicken cakes 3 mins per side. Drain on a paper towel. Toss salad greens with balsamic dressing and divide among 4 serving plates. Top each with 2 chicken cakes; drizzle with Golden Aioli and a dollop of Tomato-Basil Relish. Mix together 1 cup seeded and chopped plum tomatoes with 1/3 cup chopped red onion, 2TBS silvered basil leaves, 1 tsp basil pesto, and 2 TBS balsamic/oil dressing. For a starter I made Cauliflower Soup. I have actually never made Cauliflower soup before but I recently had some at the Glass Onion and knew I needed to recreate it asap. It was such a silky smooth soup with amazing flavor. I googled a few recipes then ended up creating my own version. This soup was so easy to make and I just let it simmer for a few hours before we ate. It reheated fantastically the next day as well. This just might become your new favorite soup. I added in truffle oil and crumbled bacon which let me tell you made this soup freaking fantastic- but you can totally leave them out if you prefer. Cut cauliflower into 1-inch flowerets. In a large baking pan toss cauliflower with oil to coat and roast in middle of oven about 30 minutes, or until golden. Sautee celery, carrot, onions and garlic in olive oil for about 5 minutes. Add in broth, roasted cauliflower, and herbs. Simmer 30 min-1 hour, or until cauliflower is very tender. Discard bay leaves and in a blender puree soup in batches until smooth (or use an immersion blender if you have one), transferring to a bowl. Return soup to bowl and stir in cream and salt and pepper to taste. Heat soup over moderate heat until just heated through. Stir in truffle oil just before serving. Optional- we served ours with crumbled bacon over top. Oh yum, boh recipes sounds delish. I have been making the tuscan chicken cakes for years and they are so fabulous!! Thanks so much for stopping by Fashion Truffles! I'm so glad you found me via The Vault Files :) I'm now following. And will obviously need to make that cauliflower soup! I want to make this tonight!! Love love love it all. Both sound amazing! I love Cauliflower, so a soup would be perfect on a winter day! 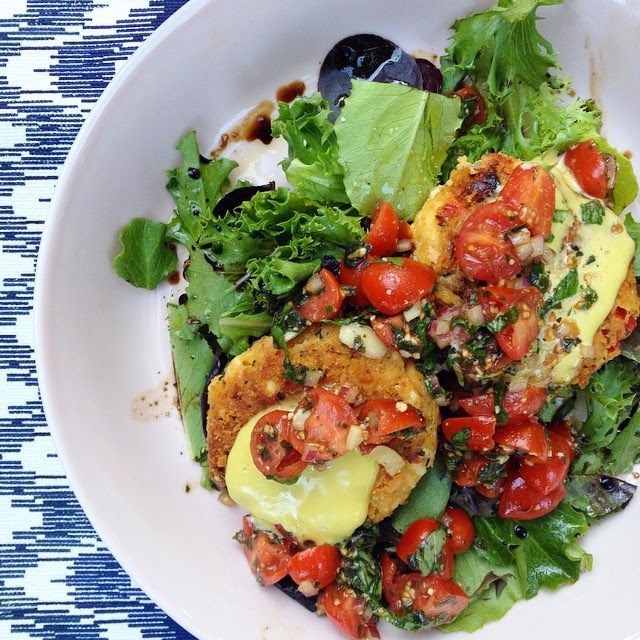 Those chicken cakes with the tomato basil relish look AMAZING!! Yum yum yum! That looks like my perfect dinner! I must make these soon. Maybe add green olives to the tomato topping. Ok. I need to make those chicken cakes!! We have been making the same Tuscan Chicken Cakes for years too, it's a family favorite, so delish. Fun to see the recipe circulating!! These are being added to my must try list, yum! I wish my food pictures looked even half as delicious as yours! Those chicken cakes look delicious! Both sound fabulous! Thanks for sharing! yumm it all looks fabulous! These look fantastic! I will be making both for sure.